Despite having an Indonesian name, Kim Jeffrey Kurniawan is born and raised in Germany with little knowledge about Indonesian football. Interestingly, the unknown player became the talk of the town when he signed for one of the biggest clubs in Indonesia. At one point, he even went on to don the Indonesia National Team jersey. Last month, Junpiter Futbol managed to sit down with Kim at his humble abode for a chat and the soft-spoken Midfielder did not hold back and shared his footballing stories. JPF: You started playing football at a very young age but when was the time you decided to be a professional footballer? KJK: It was always my dream to be a professional footballer. I joined a professional football club when I was 6 years old. Even in school when I was asked what was my dream, I would always say I wanted to be a footballer. Then again, the path of a professional footballer is never easy. I am glad that my family has been very supportive. I still remember my dad used to drive me to the training ground, which was 45mins to an hour away, everyday. And also because of that, I hoped to repay their support by doing well in football too. JPF: All of us know that you grew up playing football in Germany, able to share with us how was the football environment like when you were growing up? KJK: Honestly, growing up playing football in Germany was never an easy thing. It was a harsh environment. Yes, I did experience a little discrimination because of my physique and Chinese origin. So I was always treated like a foreigner in Germany. In fact, I am still being treated like a foreigner in Indonesia too, haha. I still remember there were once when I was in Karlsruher U-17, my head coach said to me, “Kim, if you are 10 centimeters taller, you would be in the first team”. Honestly, it was hurtful especially coming from your own coach. So how I deal with it? I took those unpleasant comments in my stride, I let my feet did all the talking on the pitch to prove the critics wrong. JPF: For a footballer like yourself, is there any footballer that you look up to? KJK: They are actually 2 footballers that I look up to as both of them influenced me greatly. The first footballer was a former Lebanon National Team’s player, Bessem Noureddine. I was playing for the U-14/15 while Bessem was playing for the U-19. I really admired him as he was a big star, the “Number-10” of the team playing against big clubs like Schalke or Bayern. And I think he knew that I admired him, haha! He would always be training by himself 2 hours prior to the actual training. One day, I asked if I could join him and he agreed! I was lucky, that approach of mine had led to numerous private trainings where I had learnt a lot from him. Gradually, he moved to another club. Unfortunately, few years later, I was informed that Bassem passed away in a car accident while he was on his way back from training. The second player whom I looked up to and still looking up to is none other than Marcos Flores. He is the other player in my life that teaches me more than a coach. He and I would stay back after training. He would teach me how to control the ball, how to pass the ball, how he would like to receive the ball and that made my play with him so much easier. Whenever I got the ball, I just had to look out for Marcos. Both of us understood each other very well and we showed that in the second half last season. It is a pity that he is no longer with the club this season and as a matter of fact, I am missing his presence in the team. My performance in the first few games this season was definitely affected but I just had to adapt. Hopefully, I will still get to play with him again soon. JPF: How did the taking up of Indonesian citizenship come about? KJK: The taking up of Indonesian citizenship has never ever come across my mind when I was in Germany. Unlike Irfan (Bachdim), I was not even holding on to dual citizenship. I grew up in Germany and every part of my life was in Germany. I still remember once my coach informed me that I had received a National Team called up when I was about 15/16 year old. I was puzzled, stunned and I went crazy like who was that, which country was that, haha! I couldn’t recall much but I think it was Taiwan or Thailand. Anyway, my coach turned down the offer on my behalf, as I did not belong to the country mentioned! Inexplicably, Indonesia Football Association (PSSI) first got in touch with me using Facebook. They invited me to participate in one of the charity matches in Malang. Although it was a charity match, it was also a match where some of the overseas-based footballers that had the Indonesian origin like myself were invited. Coincidentally, I also received a call from then Persema Malang’s head coach Timo Scheunemann asking if I’m keen to play in Indonesia. I had a chat with Timo and he even flew to Germany to meet my parents and me. Both of us agreed that since the charity match that I was invited to was to be played in Malang, we would use that match as a trial too. Thinking that I had nothing to lose, I flew to Malang and gave it a shot. I did well and Timo signed me. That was of course months after my citizenship was neutralized. The rest was history. JPF: First called up to the National Team. KJK: The journey to receive the called up to the National Team was certainly not a smooth one. Just before I signed with Persema Malang as a neutralized player, I suffered a fractured ankle during a friendly for the club. I had to return to Germany for treatment as none of the medical check or scanning here in Surabaya could figure out what actually happened to my swollen ankle. And it was the few months of recuperation back in Germany where my neutralization of my citizenship was done. I was determined to go back to work something out as I felt that I had an unfinished mission. After I have recovered, I returned to Indonesia to sign for Persema Malang. And because of that injury, I missed out the opportunity of playing for Indonesia in the AFF Suzuki Cup 2010. The following year, I received my first called up to the National U-23. JPF: Were you disappointed that you have not been given much opportunity with Indonesia National Team till today? KJK: The instability of the situation in Indonesia affected every footballer’s dream of donning the jersey of the National Team back since 2012; I am not the only one. It’s just that I came into Indonesia football where it was at one of the lowest points with the breakaway league formed. I received my first called up to the senior team to participate in the 2012 Palestine International Cup. I have played a couple of times for the country but as some were not classified as official FIFA games. Hence, only 1 cap (against Myanmar) was registered. JPF: Indonesia is one of the sleeping giants in the ASEAN football scene. In your opinion, what are the things that are preventing Indonesian football from moving forward? KJK: There are actually many people in the football fraternity who have great passion for the game but it is a pity that all of them are not putting their best act together to make the league clicked. We need to have a common vision and move towards the same direction in order to achieve success. Next, we need to improve our training facility. One day, we could be training here, the next day we could be training at another venue. This is not ideal for a professional football team. Lastly, we have to start to build a proper youth development system. Many clubs, or probably all the clubs in Indonesia do not have a proper youth system in place. In Germany, top down from amateur club to city team, every team has an U-6 to U-19 teams that train and play competitive matches throughout the season. This is an important age group which Indonesian football is missing out. JPF: Tell us more about your club, Persib Bandung & the support from the supporters, Bobotoh. KJK: Persib is one of the most professional clubs in Indonesia. I used to play for one of the clubs, Pelita Bandung Raya in Bandung under Coach Dejan Antonic. So when Coach Dejan moved over to Persib, he invited me to join him. I have heard so much about Persib and so when this opportunity came, I agreed to move over. The moment the media broke the news that I am joining Persib, it became the talk of the town. The numbers of followers on my social media upsurge instantly. The support that I am receiving from the supporters, in fact up till today, has always been very encouraging and motivating. I have never encountered such support ever before. And because of the massive support that I am receiving, the expectation for me to perform was extremely high. 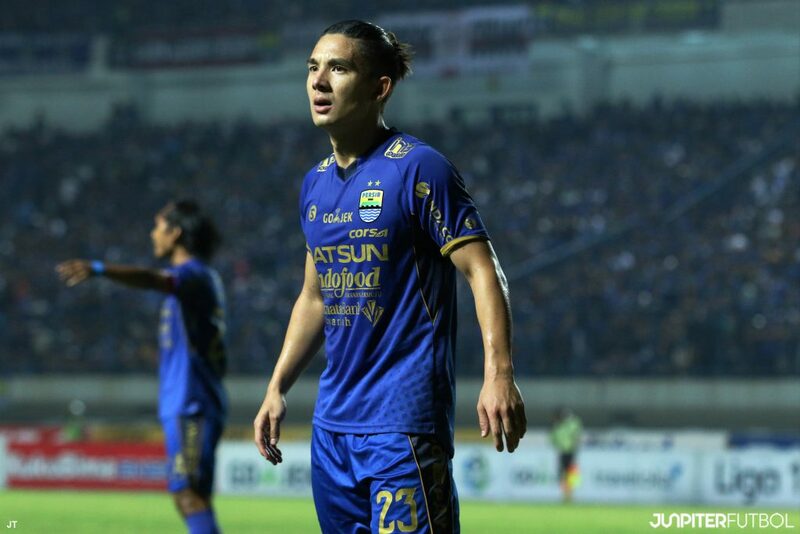 I could still recall my first few months of agony with the club – I did not perform up to the supporters’ expectation and very quickly, I became one of their most unpopular players at Persib. Supporters were attacking me verbally and their insults continued on my social media. As a professional footballer, I accept criticism positively and I’m glad that I have managed to win over the hearts of maybe not all, but most of the supporters’ thereafter. To sum it up, I really have not seen any other supporter as passionate as the one here in Persib. Literally in this area, when you are born, you will have to love Persib. The people here love Persib more than their wives; love Persib more than their husbands. They are just living for Persib! JPF: So where will we see Kim in the next 5 years? KJK: I hope to be back with the National Team. In football, that is my biggest target. Many people say that I am nothing but just a good-looking face. I want to prove them wrong. I am currently 27 year old, I am in my peak and I know that I have plenty to offer to both my club and country. Next, I hope that I can win something with Persib within the next 5 years. Last year, our team came very close to winning something for the supporters – losing 2 of our Cup’s finals. I really hope to give something for our awesome Persib’s supporters to remember. Lastly, I am already planning for my post-playing career. I am also inspired by what David Beckham has built for himself, establishing his own label after his playing days. I aspired to do the same as I am also into fashion. I wish to be the David Beckham of Indonesia.